Money talks. These days everyone’s listening. As a former business anchor for CNN domestic and international, I talked about money every day to 290 million households, businesses and airport networks. By fixing my own money mistakes, I can now help you be mindful of your money missed-takes and what to do about them. If you want to own your life, you must control your money. It’s Your Money So Take It Personally®. The buck starts here. 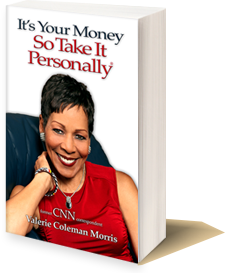 Valerie writes and narrates the nationally syndicated radio column she created in 1986 called With the Family in Mind. It focuses on family and sandwich generation issues and their money implications. The segments air on CBS Network Radio three times a week.